Rosella Mildred (Nickel) Plenert, known by most as "Rosie," passed away in her sleep at Grandwood Assisted Living at Grove, Oklahoma on January 24, 2019, at the age of 89. Rosella was born August 16, 1929, to David B. and Bertha Nickel. She attended Gordon Grade School, Goessel High School and graduated from Hillsboro High School in 1947. She received her Bachelor of Music Education from Emporia State University in 1980 at age 51. Music was always a huge part of her life from the time she was a small child. She was active in the Eastmoor United Methodist Church music ministry. She frequently sang solos, sang in the Chancel Choir, Directed the Youth Choir and the Bell Ringers, and served on several church committees. After receiving her teaching degree, she taught elementary Music education for a total of 13 years. All but two of those were in her home town of Marion, Kansas. 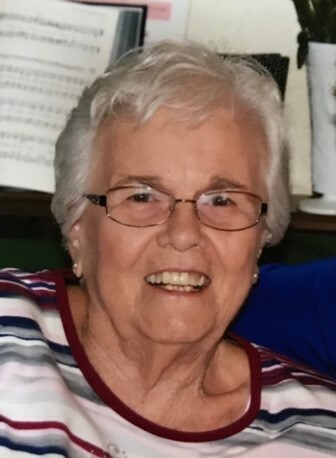 Her greatest reward was to teach music to elementary children and to have a positive impact on her students, to know that she had made a difference in a child's life. She is preceded in death by her husband, Norman Plenert, her parents, David B. and Bertha Nickel, a brother, Milford Nickel, her sister, Della Rittgers, and Brother-in-law, Don Rittgers. She will Lovingly be remembered by her children, Patty (Gary), and Terry (Patti), four grandchildren and 12 great-grandchildren. The funeral service will be Wednesday, January 30, 2019, at Eastmoor United Methodist Church in Marion, Kansas. Down Syndrome Association of Central Oklahoma, 521 W. Wilshire Blvd, Suite 130 Oklahoma City, OK 73116.